As kids we all loved to go to Toys R Us to walk the seemingly endless number of toy filled isles. As adults, Tools R Us offers us the same kind of euphoria we experienced as children, only this time with More Power. Tools R Us has a huge selection of power tools from all of the major brands, and for those of you brand loyal shoppers, you will find that Tools R Us is divided into sections based on brands. If you like yellow tools, it is pretty easy to spot the section of the building that is entirely DeWalt yellow; the same goes for Makita green, Bosch blue, Milwaukee red, etc. TRU not only has tools for construction workers, but they also have a selection of shop tools from the likes of Powermatic, and Delta. It is tool paradise. 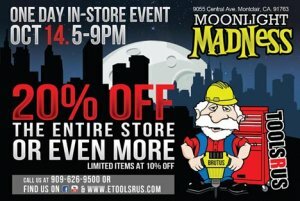 What makes Tools R Us even better is their twice a year 20% off sale, and it is coming up this Friday. During these sales, Tools R Us takes 20% off of just about every tool and accessory they offer, with a limited amount of tools at 10% off. Tools R Us also invites all of the brand reps to come out to the store so they can provide additional information, give away shirts, and offer more special prices or bundle deals. If you are in the area of Montclair California this Friday 10/14, you do want to check it out.